Winters have always been a chancy issue around McCloud. 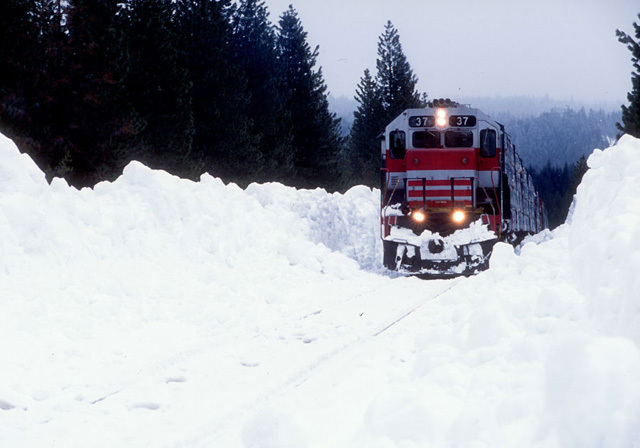 The entire railroad usually gets snowed on, with the amount of snow varying widely from place to place and from year to year. Some winters see almost no snow, while other winters see snowfalls that overwhelm the railroad and its available snow removal tools. 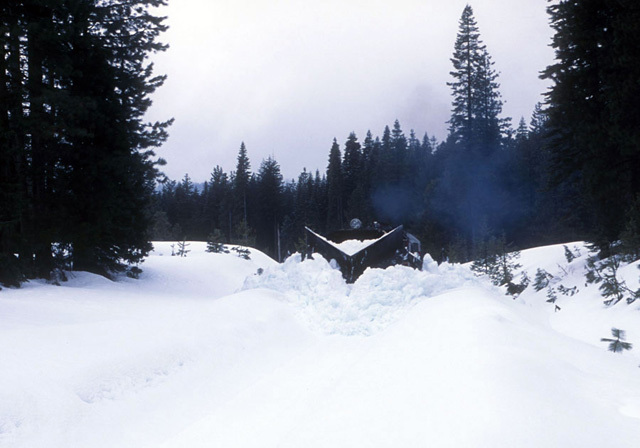 What may be the last winter of operations east of McCloud, at least under the current ownership, is proving to be another tough affair. The winter started relatively slow enough, with the snowfall finally becoming serious in March. Thirty two inches of snow fell in McCloud on Sunday 6 March 2006. The train had brought loads back from Burney at the end of the week before, and the first priority on the railroad Monday morning was to get the line to Mount Shasta open so that those loads could be delivered to the Union Pacific interchange. The spreader spent all day Monday clearing the line west of McCloud, with the only real snag coming when the snowplow derailed in the Mount Shasta yard. The train crew had it re-railed within thirty minutes. The spreader left 7-8 foot high banks in its wake that day. On Tuesday the train crew took the outbound loads to Mount Shasta City, returning to McCloud with empties on Wednesday. Once back in McCloud the train crew picked up the spreader and headed east with one unit. Snow started to fall on the train as it rolled through Algoma. The train made it as far as Bartle Gap, where the snow got to be too much for the one unit to handle. 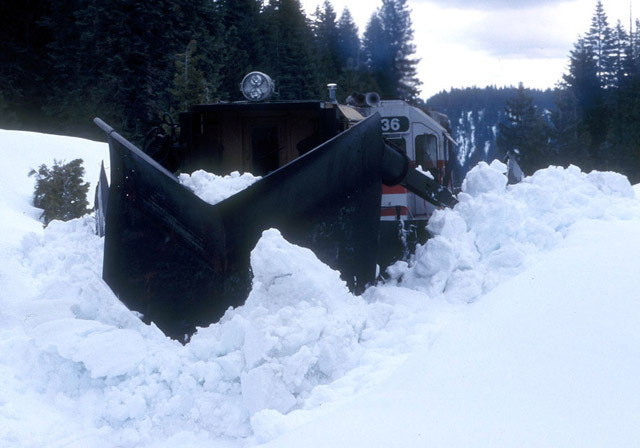 Engineer Bob Shaarah reported later on that the snow banks at Bartle Gap rose to the level of the cab roof. The train retreated back to McCloud, picked up another diesel, and headed out again for Burney on Thursday. Things started to go wrong again during the week of 12-18 March when the spreader derailed on Dead Horse Summit, plugging the line tight. 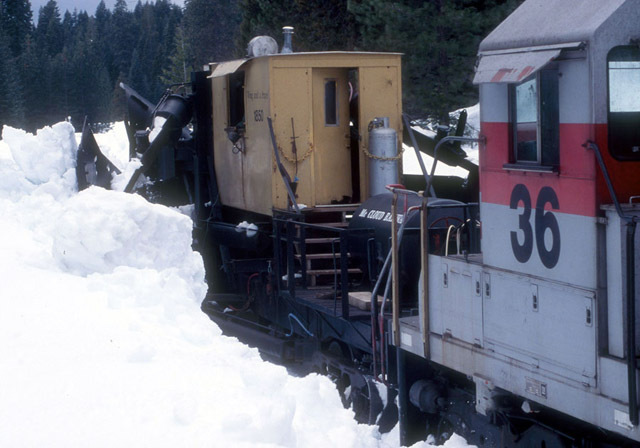 The crews worked through the week, eventually getting the machine back on the rails and back into McCloud by late in the day on Saturday, 18 March. 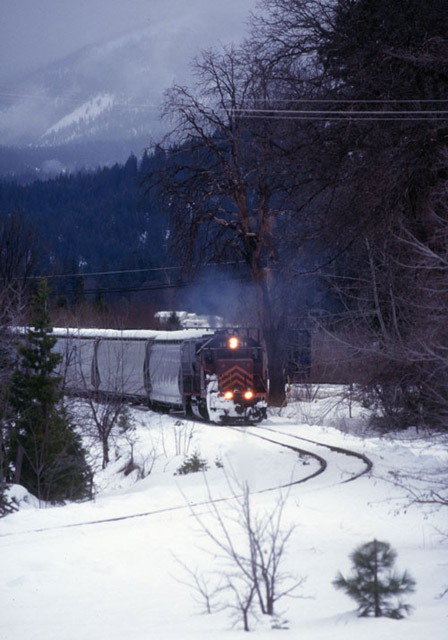 This meant that the line west of McCloud had not been plowed for the better part of a week, forcing the Shasta Sunset Dinner Train to make a rare run east of McCloud. The train made it about ten miles out of McCloud before turning back. The spreader opened the line to Mount Shasta City on the following Monday, 20 March 2006. The troubles continued in the last week of March when ice accumulations derailed one of the diesels at Signal Butte. The railroad had to open the road into the switchback with a CAT to get heavy off-rail equipment in to get things back on track. On Thursday 6 April 2006 a freight went east out of McCloud, trying to make Cayton. The train made a litte past Bartle before stalling out due to the amount of snow covering the rails. Once again the call went out for the spreader, and it went to work. A mechanical malfunction forced the spreader to halt for a good part of Thursday afternoon, with the problem finally fixed after a couple hours of work. The spreader got the line cleared enough to allow the Cayton job to continue. 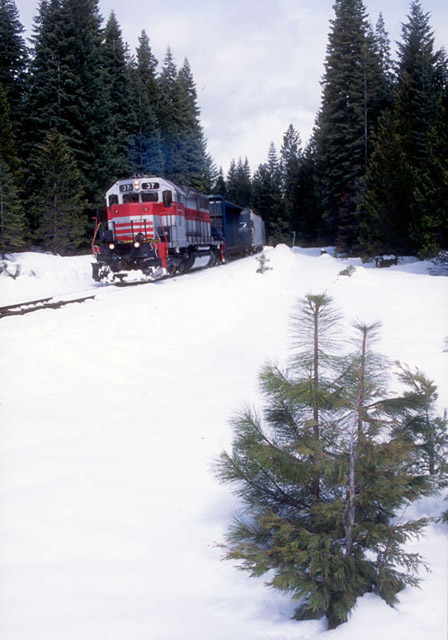 On Friday 7 April 2006 the spreader went to work west of McCloud to re-open the line to Mount Shasta. So goes another year of winter operations on the McCloud Railway. McCloud Rails staff wishes to thank John West, Travis Berryman, and Roger Titus for the information included in the narrative above. John West sent along some photos he has taken during the first two weeks of April that are displayed below. Thank you very much, John! The spreader at work rolling into Curtis. On another day the spreader is working near at Pierce, about to cross the Ski Park Highway. The plow train has crossed the Ski Park highway and is starting down the west slope of the mountain. After the line is cleared...the #37 rolling a string of loads through Bartle on the way back to McCloud. On another day the #37 is rolling a string of empties by Milepost 37. The #38 leading a short freight out of the Mount Shasta yard.